Sanyo has once again made another compact digital camera/camcorder but unlike the Xacti HD1000 and Xacti HD700, the Sanyo Xacti CG9 is not capable of recording high definition videos. What the Sanyo Xacti CG9 does offer is a 9.1 megapixel still image capability and MPEG-4 recording. Like the other Xacti line, the Sanyo Xacti CG9 is very compact and there’s not much design difference between it and the Sanyo Xacti CG65 except that maybe the former has a more roundish and a bit bulkier design. It also has a cool shiny exterior and comes in three colors, black, red and white, and just pure white (colors available in Japan). The Sanyo Xacti CG9 can record high quality MPEG 4 AVC/H.264 videos which is compatible with most systems. The MPEG-4 AVC/H.264 video codec also allows 1 hour video recording on a 1GB SD card. Sanyo opted to chuck the CCD sensor that was previously on the Sanyo Xacti CG65 and opted to go with a 9.1 mega pixel CMOS sensor on the Sanyo Xacti CG9. I don’t know if that’s a good idea as CMOS sensors tend to produce lower quality and noisy images compared with CCD sensors. I’m expecting a greater battery life on the Sanyo Xacti CG9 compared with the Xacti CG65 because of the change from CCD to CMOS. 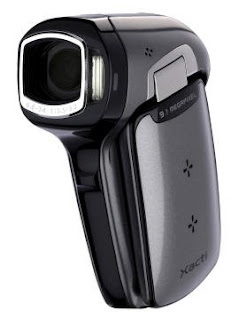 The Sanyo Xacti CG9 is also capable of recording videos at 60fps. Ever since face recognition technology has become standard on digital cameras, manufacturers have a funny way of naming these technologies. Sanyo takes the cake by naming their facial recognition technology, “face chaser”, which can recognize up to 12 faces in a still image. The LCD screen on the Sanyo Xacti CG9 is around 2.5 inch, it also has built-in flash, 40mb internal memory, image stabilization, 5x optical zoom and loads of other features. Ultimately I wasn't very pleased with the performance of this in anything but bright daylight. It's a shame really as the camera has some nice features: In-the-camera editing, full 9Mpixel stills, xenon flash (for stills), auto redeye elimination and a very comfortable and ergonomic design.